The following is an excerpt of a story I wrote for a new book called The Insider’s Guide to Supervising Government Employees, edited by Kathryn M. Johnson (Management Concepts Press 2011). The book is a collection of stories from many supervisors whose purpose is to help government supervisors (new and seasoned alike) navigate their responsibilities and challenges more successfully. It covers several key areas including understanding yourself, getting the best work from others, and supervising in a changing work landscape. In this particular story, I illustrate the importance of ongoing self-development to help supervisors continue to achieve success in their role. 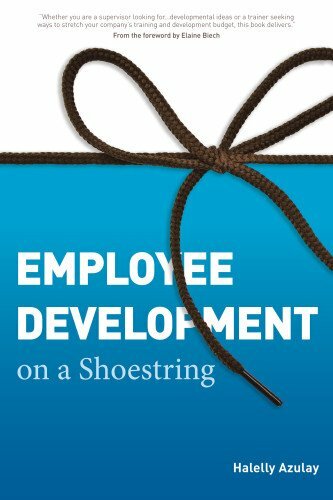 In my upcoming book, Employee Development on a Shoestring (ASTD Press, expected pub. date April 2012), I describe in much greater detail both the value and suggested approaches for many development methods that happen outside the classroom. Chris’ excitement was through the roof when he learned that he had been promoted. Finally! He was now officially a supervisor of a newly formed team in his agency. Chris felt a quiet confidence in his ability to excel as he emailed his mentor, Soo-Lin, to share the good news with her. After they scheduled their next monthly “coffee talk” meeting, Chris sat at his desk making lists of ideas and action items. A few weeks later, Soo-Lin relaxed into her chair as she congratulated Chris once again on his accomplishment and listened to his tales of his first month as a supervisor. Sipping her coffee, she listened to his stories of excitement and frustration from her perspective of having been in supervisory roles in the federal government for the past 20 years. “What are you doing to ramp up your supervisory skills, Chris?” Soo-Lin inquired. “What do you mean?” asked Chris. “I’m not sure I have any ideas. What do you suggest?” said Chris, looking at Soo-Lin quizzically. Over the next hour, Soo-Lin shared with Chris some of the resources that she found helpful, including books, seminars, and training classes. But it was the story she told him that really got Chris thinking about how to keep his skills and knowledge fresh now and into the next stages of his career development. “You know, when I first got promoted, there were no supervisory training classes offered and no resources given to me to prepare me for my new role. I had to learn as I went, the hard way. Things went very well for the first couple of years and my hard work was rewarded and rewarding. “But then, things began to shift. I was no longer getting the results I wanted from my staff. They seemed unmotivated and deflated, and I felt frustrated with my job. I applied the same techniques that had worked before, but they were just not working in the same way. I felt really stuck and unhappy. Word got around that there might be a reorganization in our department and I started to worry that I might lose my job. “That’s when I began to realize that I had become stale; my skills and knowledge were not sufficient to produce the performance results I wanted to see. I felt baffled and lost, so I started reading every management book in the library, searching for answers. I also started looking for role models to talk with, both inside and outside my office and agency. I was amazed how happy these successful supervisors were to share their ‘best practices’ and ‘lessons learned’ with me, and it was great to learn from them about things I could do or avoid doing—and not have to learn them the hard way! One told me that he attends the monthly meetings of our field’s professional association to learn new techniques and connect and network with other professionals with whom he collaborates and shares ideas. So I started attending these meetings also—what an eye-opening experience! This is an exciting time to be a supervisor. You have the opportunity to influence others in a changing landscape. You will be challenged to handle day-to-day issues effectively in the context of an ever-evolving work environment. The best way to create a balance that serves both your employees and your organization well is to keep strengthening your personal capabilities as a supervisor. Only then will you be ready and able to help others envision and prepare to meet the demands of the 21st century government work environment. What are some books, training, and other resources you could access to upgrade your supervisory skills? Are there resources that would help you on an ongoing, continuous basis? Who are some key people who could help you learn and develop your supervisory skills? Are there any groups you could join or people in your current network you could tap to become your mentors or “master-mind” group? Can you branch out and increase your network to include role models and kindred spirits? Can you find opportunities to bring supervisors together? Who can—and is willing to—share their lessons learned?